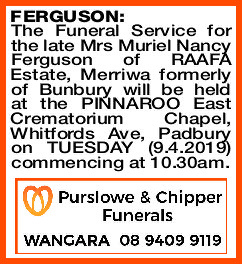 The Funeral Service for the late Mrs Muriel Nancy Ferguson of RAAFA Estate, Merriwa formerly of Bunbury will be held at the PINNAROO East Crematorium Chapel, Whitfords Ave, Padbury on TUESDAY (9.4.2019) commencing at 10.30am. 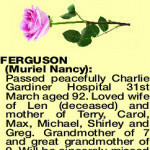 MURIEL NANCY Passed peacefully Charlie Gardiner Hospital 31st March aged 92. 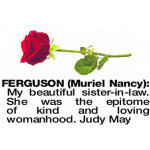 Loved wife of Len (deceased) and mother of Terry, Carol, Max, Michael, Shirley and Greg. 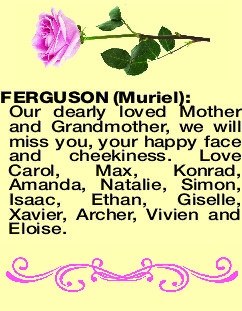 Grandmother of 7 and great grandmother of 9. Will be sincerely missed and memories cherished. 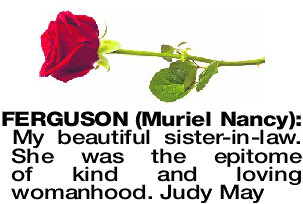 Loved memories of our mother passed 31st March. Will be sincerely missed by all. You fought the battle right to the end, never giving up. Michael, Shirley, Crystal and Aiden. 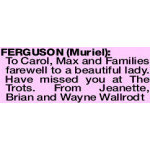 FERGUSON MURIEL Our dearly loved Mother and Grandmother, we will miss you, your happy face and cheekiness. 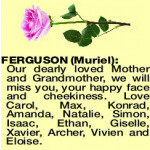 Love Carol, Max, Konrad, Amanda, Natalie, Simon, Isaac, Ethan, Giselle, Xavier, Archer, Vivien and Eloise.